iancanton wrote: the stamp will be valid. onward and upward! 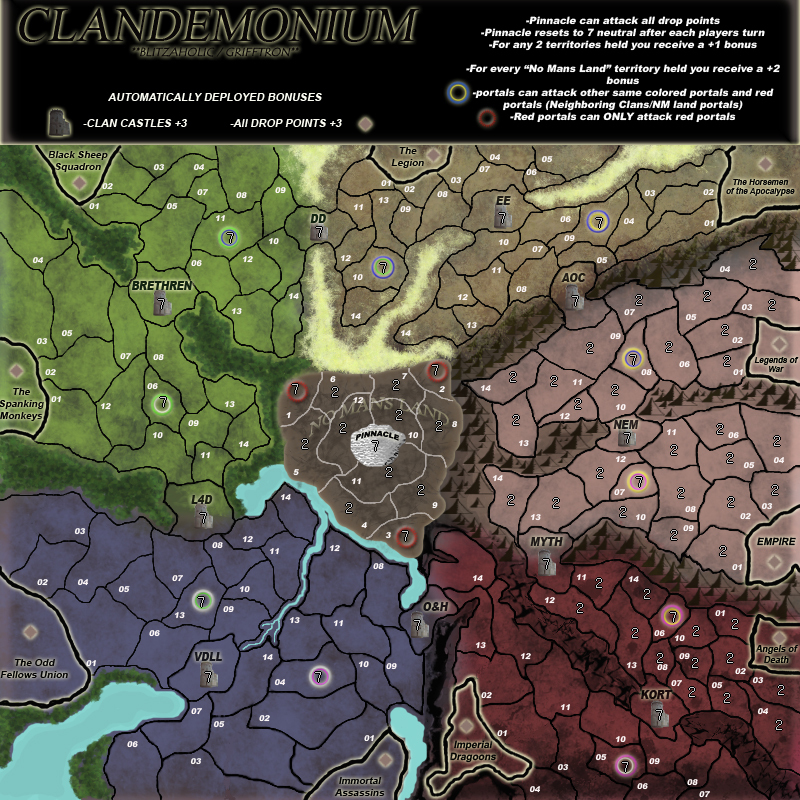 The time has finally come to put a Clan map in with all of the great maps here on CC. 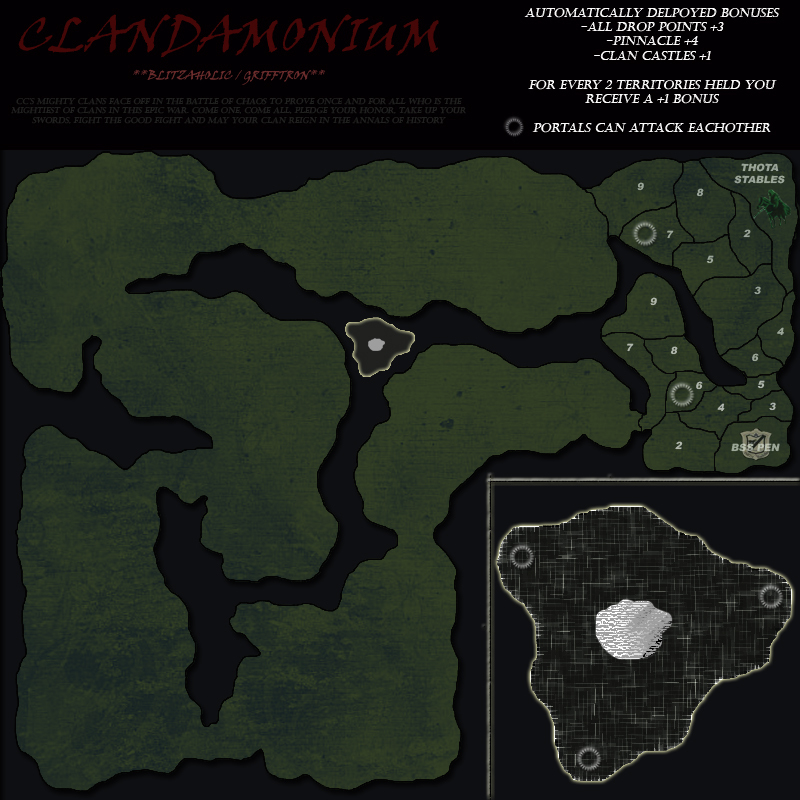 Blitz & Kab have worked together to come up with a new map called "Clandemonium." the Top 10 in the 2009 CLA Clan Rankings from Nov. 2009, with a recent update of Jan. 2010. As for the map itself, we have 10 main clan landing points which would be the 10 main clans from JPcloet's ladder rankings. The rest will be neutrals, the "Clan's Ground" will have more neutrals (7) and the next 10 clans in line would get their clan name on the map, at least your clan may be represented and has a bonus area. The Pinnacle will be assigned 10 neutrals. The clan portals can only attack same colored clan portals and Deep Land portals and go into other lands. As for Deep Land and Pinnacle I think its pretty clear on the Key what those will be, and of course like the key says the bonus would be +1 for every 2 clan territories you own from any clan region above 6, and +3 auto for any "Clan's Ground" owned and held, this would replace continent bonus's. Also, for each portal you own and hold is +1 bonus (not auto-deployed). Note also, +2 for every one no mans land territory owned. All clan portals can attack Deep Land portals and clan portals can also attack other clan portals with same color, this means Deep Land portals cannot attack clan portals as the clan portals is only one way attack to Deep Land portals. Will you attack clans neighboring to you? Will you attempt the portal options? Will you run to Deep Land to see if you can get its sweet rewards? Will you try to take over "Pinnacle" for its awesome location? Will you just sit in your clans continent like a big baby? We specifically made this map big enough so that it will be able to be played on many different ways, including quads. As we wrote above there are 20 clan names, but, 10 main clans on this map with starting points, making for 10 clan "continents" each clan. This is also in case lackattack ever extends 5 vs 5 games. And as shown on the map key mountains are impassables. The next 10 clans who will not have starting points, but, a single territory named Clan's Ground, will have their clan name represented on the map. We appreciate all comments and help, our aim is to make a clan map that all players on CC will enjoy playing on. Last edited by Blitzaholic on Mon Mar 21, 2011 12:37 pm, edited 127 times in total. Like the idea. But no Mermaids? Guess our own DJ Teflon will have to make a Fat Mermaid map. jefjef wrote: Like the idea. But no Mermaids? I think griff took the the top 8 in the 2009 CLA Clan Rankings from Nov 2009 at that time, we know a lot has shifted since then and by no means are these the best 8 clans, they just happened to be there in that order of this idea. maybe we could go to ten, but, that may be too many. I am open. do you like the color twist or icy better? Looks good so far Blitz. The idea behind the bonuses seems a lot like the feudal map which I am a fan of and I think it is a good idea because it is probably the most popular map on CC (or one of them). Chuuuuck wrote: Looks good so far Blitz. The idea behind the bonuses seems a lot like the feudal map which I am a fan of and I think it is a good idea because it is probably the most popular map on CC (or one of them). Thx a lot chuuuck, I was hoping many would like that concept, I know you can't please everyone. Thanks george, griff deserves a lot of the credit, I am just trying to help shape and mold ideas. 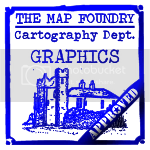 Locked for now, and to be reopened and moved to it's proper forum upon the reopening of the Foundry. I agree and I hate the look of that map. Would it be possible to put space in the "impassable" regions between the clan realms? Right now there are thin little mountains that you can't really see, but more to the point it makes the map look more like pie slices. If these barriers were widened, and say...Water inlets instead of mountains in the areas that the mountains touch the water "ring", and further back, toward the sides of the map, the mountains could be thickened ALOT. It would make the Terts smaller, but this would be an ok sacrifice (especially if you distributed the loss of space around), and it would give a little more unique aesthetic look to the map. Make the inlets and larger back mountain ranges meander and be natural, non uniform looking. There are lots of maps with mountain ranges that look nice...they are shaded and continious, with rocks and craigs... and they take up space so they FEEL like impassable barriers. The Set up and play look nice, lets not skimp on the art, everyone knows ugly maps have a visceral reaction and people tend not to play on them. The nice thing about maps such as feudal (for example) is freeflowing, natural looking lines and simple, obvious demarcations. Looking at it some more, the attack routs on the sides, between each realm and the one next to it, could be represented as mountain passes, and would blend nicely into the mountains behind, and maybe a small bit of mountains in front. (behind and front meaning radially in and out). And the best thing is they could alternate. Some could be land bridges across lakes, some could be mountain passes, some could just be wall fortifications and ramps over them. ect. That way the map doesn't look like a bunch of copy paste. I don't really like the idea of a map based on clans, since clans are a transient thing. Snowgun wrote: And the best thing is they could alternate. Some could be land bridges across lakes, some could be mountain passes, some could just be wall fortifications and ramps over them. ect. That way the map doesn't look like a bunch of copy paste. Blitz and I are in the process of changing tons of things on this map right now, we are focusing mainly on the game play right now, I will focus more on the looks of the map once we get a solid game play and the majority of people commenting on the map are happy with the game play. But that is an excellent idea of changing some of the connections into bridges over rivers or broken down walls and such. Thanks for the comments Snowgun, we need lots of ideas right now as we are in the beginning stages of this map. We might be adding another 10 clans to this map for a total of 18. Our in boxes have been full of PM from lots of different clans members and lots of those on CC with lots of different ideas and comments. So we are still tossing around a lot of great ideas for this map. Ugh not another feudal map! How about getting rid of most of the neutrals (except no man's land) and changing the sizes of the clan's continents and bonuses to reflect their rankings? It would look more interesting, contain more interesting clan stats and be more appealing to non-feudal lovers. 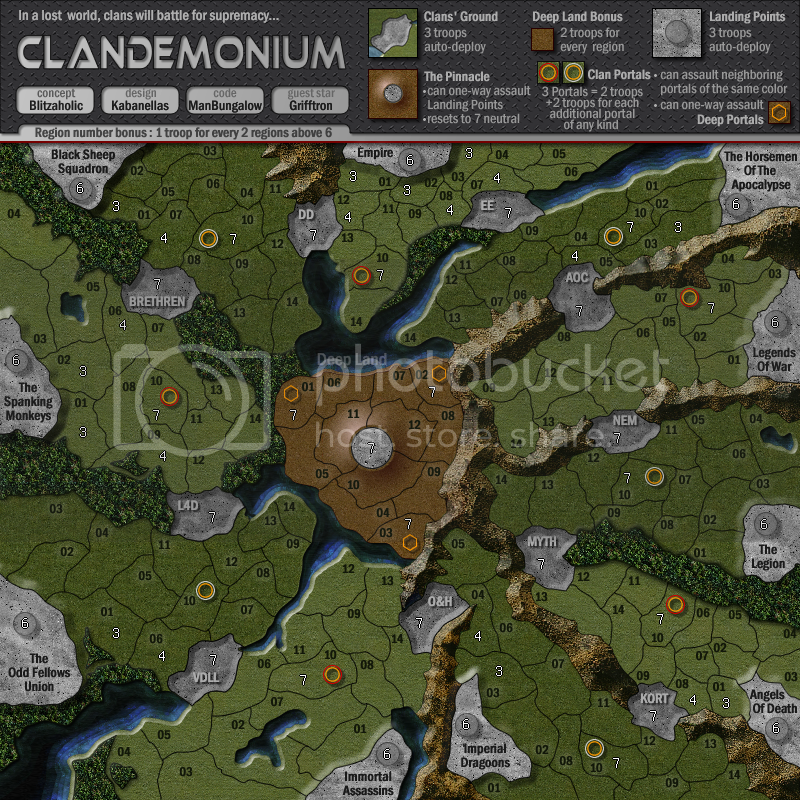 How about naming each territory by clan members? PS. 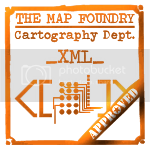 please use BIGIMG tags for the map image in the first post. Nobody likes clicking through unnecessary links. Be more generic: Clan Leader, War Minister etc. Use ladders as connectors, other divisors other than mountains, you'll need to get really creative here. Looks great (bar the unfortunate omission of AOD of course). - 18 clans may be too many, for gameplay & likely longevity of the clans (we'd be happy just to take Thota's spot, so you don't have to swell the numbers too much). - I'm not sure if the bombard will be used as you don't need to hold all a clan to get a bonus, and you could put your defensive stack on b1-b8, unless they are killer neutrals. Have you considered alternatives, eg "tunnel" attacks emerging into a corner of the clan, or tunnels that can only be entered from a neutral area to attack into a clan? Not sure exactly what is best, but I think for smooth gameplay if you have fixed starting points, you should consider having some cross-map routes. Diplomacy, Truce, Agreement (I forget the rest) There were like 8 suggested. I think this is a cool idea. From a purely thematic approach, I agree with JP. I would like to see some of the themes common to ALL clans around here. Having said that, if you are really aching to get some actual clan names in there, perhaps some of the longest running clans would be a good bet, since those should have the best life. 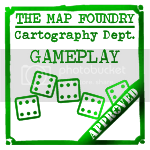 But I also think this makes a strong argument for building different map skins into the site, allowing for frequent updating of graphics without any other map revisions. I like the layout so far, and the design. I also like the "build your own bonus" structure. I am also wondering if maybe the portals should not just be bombard but full movement? Just to open things up for smaller games. FarangDemon wrote: Ugh not another feudal map! Seeing, that clans are all about team-games, shouldn´t a clan-themed map strive to be good for team-games too ? 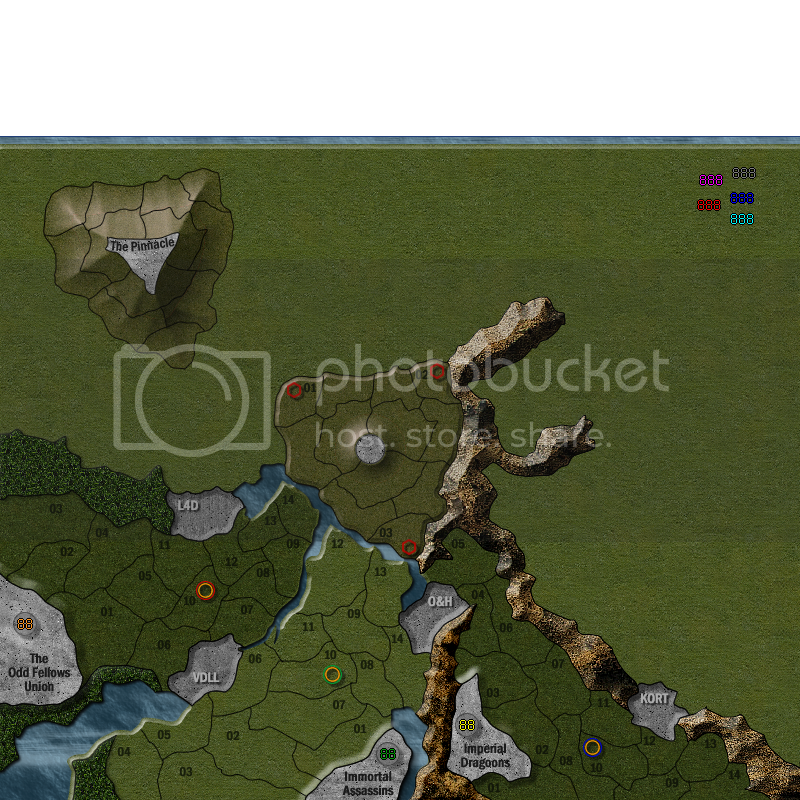 Here is a new version of the map, changed the mountains and added 12 more clans. Same style of "Feudal" game play but just with more clan names on the map. We already have PM all clans and have permission from mostly all of the newly added clans, just waiting on a few more. Hmm. I wonder if there is a way to start this map out as dropping into "homelands" as in Feudal but also be more appealing to "non-feudal" lovers. I myself am not the biggest feudal fan and stink at the map but i would love to play this style of map, the game play is a lot different i feel. Give me more input on this. Thanks. By the way Farang, where you at in Tland, i am in CM currently in Phuket. natty_dread wrote: How about naming each territory by clan members? We are already on this. 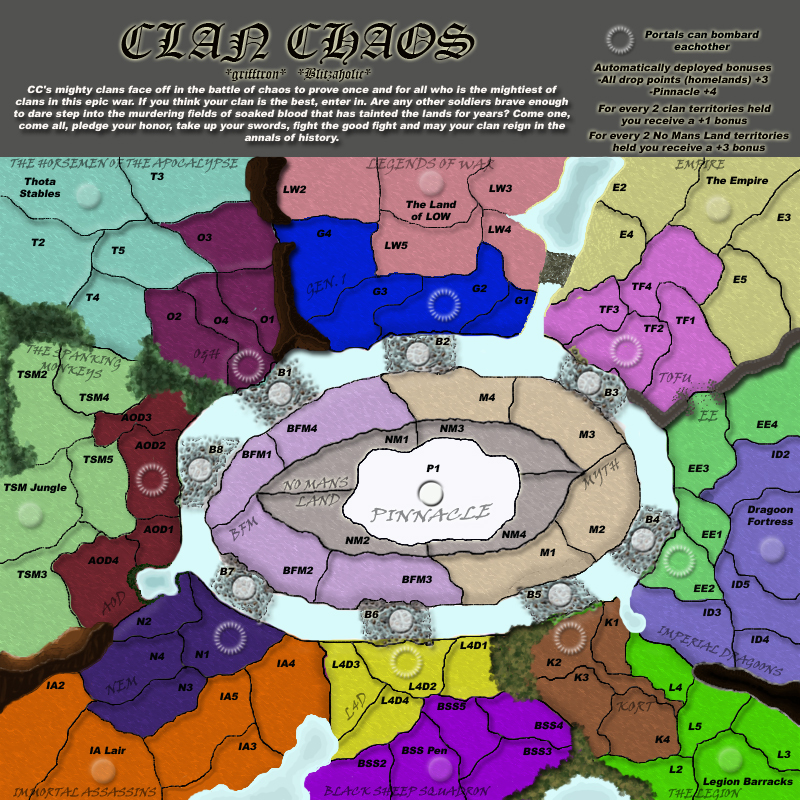 Many clans have already PM Blitz and I names for their territories, we were thinking to let each clan name their own clans, depending on how long names are we might be able to fit most on the map, other then that put them in (.....) under the map of course. do you mean more generic with the name of the map? 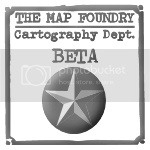 We were thinking of a change for the name, just what came to our minds at the time, title of map probably will change. And what do you mean by ladders? blitz said something about this too to me. Explain more please... and names on this map can be changed easily as the whole map is in layers. NP on that. laughingcavalier wrote: Looks great (bar the unfortunate omission of AOD of course). Your on the map now next to the spanking monkeys . you said consider having cross map routes, thats why we had the portals... the portals will be used as connections into 8 continents on the map. As said above the portals are full movement and they connect to every other portal on the map. Maybe it is not clear in the key, ill look at it again. Thanks for the support and for following, we need lots of ideas at this stage and every comment counts weather it is positive or negative so that we know what we need to change and what people would like to see this map become. We know we cannot meet everyone's standards but we will do our best to make this map enjoyable for all. Edit: Yep that Key only has bombard on there for the portals my mistake, i will change this and will be on next update of the map. Last edited by grifftron on Thu Jan 07, 2010 5:07 am, edited 3 times in total. I thought this map would be a fun map for team games... ? Last edited by grifftron on Thu Jan 07, 2010 9:02 am, edited 1 time in total.